It’s the holidays and here in New York City, that means ‘Tis The Season for Boozy Power Lunches. We’re all so freaking busy and have so much going that it’s just about too much to take. But amongst the madness, we still have to eat so why waste that precious lunch hour on a greasy slice, an over-priced Deli Sandwich or a plastic tray full of reheated mix-and-match from the hot buffet? Call a meeting to talk year end review or call up some colleagues and cement the conversations to have a conversation about new business in 2012 and book up a table at that place you’ve been meaning to try and book yourself a Boozy Power Lunch. That’s exactly what I did with my good buddy Mark this week. Mark is the New York area brand manager for the Lagunitas Brewery. Mark and I do a lot of work together you see and with a person as creative as Mark backing a brewery as special as Lagunitas, there’s always new and fun events in our horizon. Whether it was our Slayer Beer pairing event at Idle Hands, Kev and Rev’s Awesome Parking Lot BBQ at the Nassau Coliseum Warped Tour, the New York and Chicago Food Film Fests or most recently, the Get Real Beer Bar Fest, our professional paths cross quite often. With very little time left in the working year, Mark suggested we meet up to chat and power lunch over one of his favorite Burgers. Plunked down, right off Park Ave, smack dab in the middle of the Gramercy section of NYC, you’ll find Primehouse New York. This NY Steakhouse is a member of the massive BR Guest Hospitality Group, bringing you some of the most popular and favored restaurants, bars and hotels, especially in the NYC area. Most NY Steakhouse’s are filled with dim lighting, lots of rich wood paneling, fixtures and furniture and have a lounge-y type feel. This is where Primehouse New York sets itself a part. The dining room, separated entirely from the lunch crowd filled bar area, is brightly lit due to massive glass windows and white tiling that give it an elegant palatial feel. The menu is simple, especially a lunch, offering a some apps, a selection from the Raw Bar, Salads, Steaks and of course, Burgers. No proper business lunch between two mavens of the Beer industry would be proper without some malty fun stuff, so we both ordered a delcious Anchor Steam Porter to start off our power lunch. Both Mark and I ordered the Classic Burger, Charbroiled with Lettuce, Tomato, Red Onion, Mark’s with Cheddar and mine finished off with Gruyere Cheese. All of the Primehouse’s Burgers also come with Steak Fries, but if you’re an insider like Mark, you know to order them with Asiago Cheese & Truffle Oil! 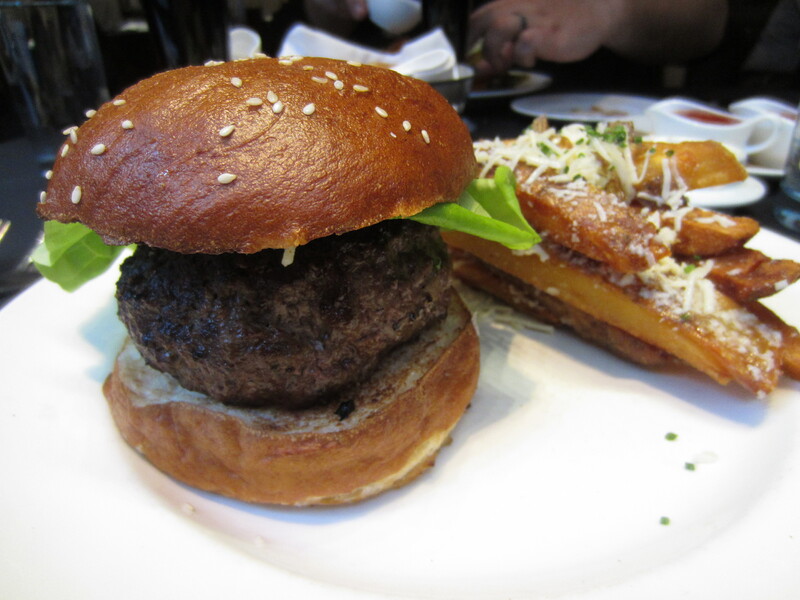 The massive and hulking Burger came served on top of a soft yet very sturdy Bun, topped with Sesame Seeds and is toasted before it’s served. The Beef is cut from a lean side of quality Beef and packed together before Charbroiling. 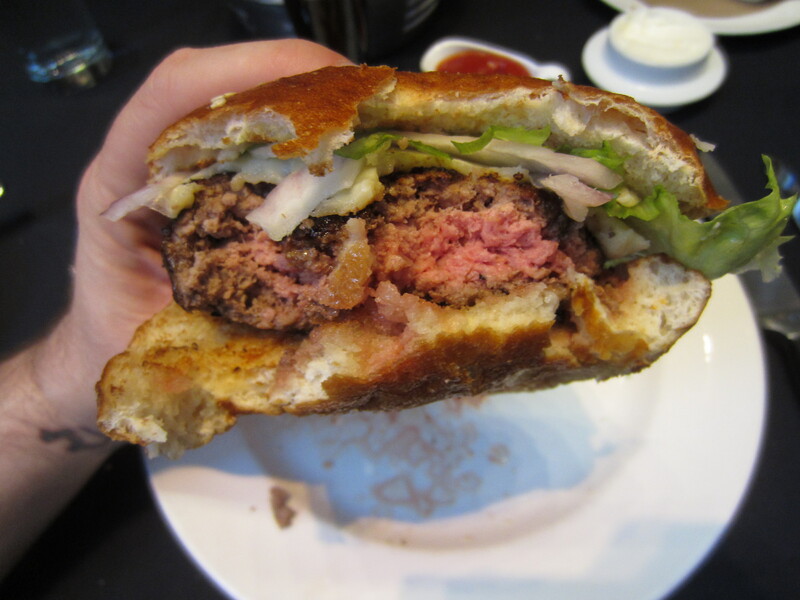 The Red Onion, which was fresh, crisp and tasty was actually a little too much taste for the Burger and after a few bites, had to be removed. What was left; Beef, Cheese, Lettuce & Bun was a a great Burger for a power lunch. 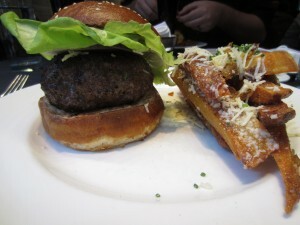 The Fries, MASSIVE in size, were cut from a full Potato, Skin in tact, were fantastic. 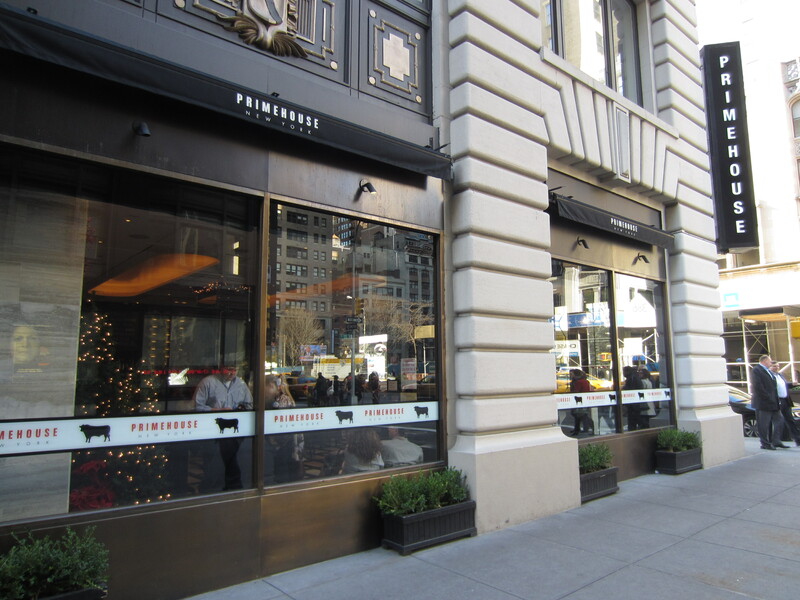 Whether you’re looking for a good Steak, a good Burger or a good power lunch, Primsehouse New York is a good idea to fit the bill. 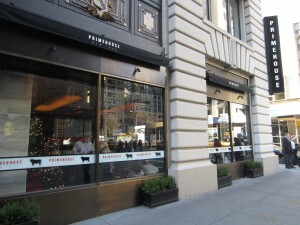 Primehouse NY scores an 8 on The Rev Meter. This entry was posted in Beer, Burgers, Gourmet Burgers, New York and tagged B.R. 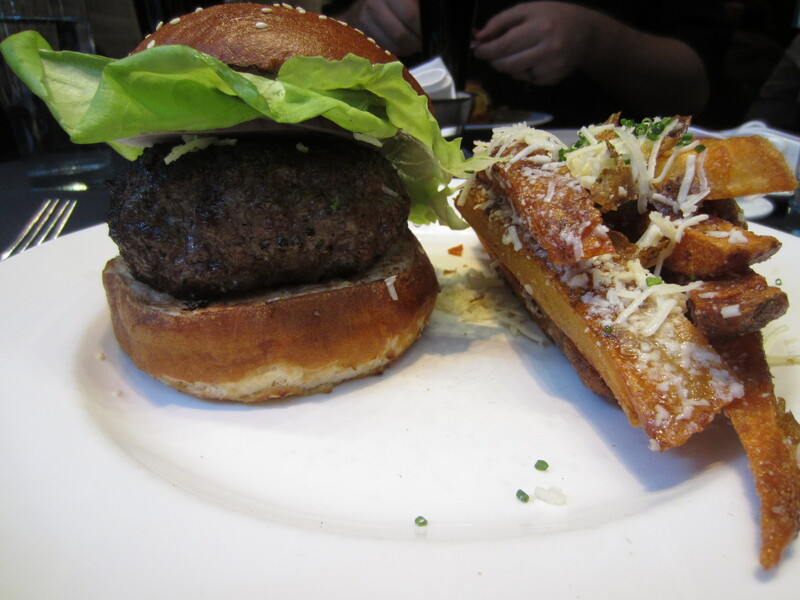 Guest, br guest, burger, cheese, ciancio, conquest, french, fries, great, hamburger, lagunitas, new york, ny, nyc, primehouse, rev, review, steak, steakhouse, the, the rev meter for social community. Bookmark the permalink.